The opening credits of Vincente Minnelli's "The Band Wagon" play over a top hat and cane, which would remind us of Fred Astaire even if he weren't the star of the movie. Then we join an auction of movie memorabilia. The top hat and cane don't sell, even when the auctioneer pleads, "50 cents, anyone?" They belonged to a has-been hoofer named Tony Hunter, and now we see him, played by Astaire, on a train to New York City. Maybe he can make a comeback on Broadway. From the way he sings "By Myself," he doesn't seem hopeful. "The Band Wagon" (1953) came only a year after the same writers, Betty Comden and Adolph Green, wrote "Singin' in the Rain." Both are great backstage musicals, one about Hollywood, the other about Broadway, one starring Gene Kelly, the other Fred Astaire. "Singin' in the Rain" is a comedy, but "The Band Wagon" has a note of melancholy along with its smiles, a sadness always present among Broadway veterans, who have seen more failure than success, who know the show always closes and that the backstage family breaks up and returns to the limbo of auditions and out-of-town tryouts. The movie takes a would-be musical through all the stages of writing, casting, production, choreography, rehearsals, failure on the road and eventual triumph on Broadway. It's so happily aware of its genre that we actually do hear mention of renting a barn and putting on a show. But it draws on experience with the actual working conditions of Broadway professionals, just as "Singin' in the Rain" knew a lot about how movies are made. "Singin' in the Rain" was the work of a fresh newcomer (Stanley Donen was 28 when he directed it). "The Band Wagon" is informed by a Minnelli who, at 50, had logged a long tour of duty in show biz, not least as the husband of the complicated Judy Garland. When Astaire made "The Band Wagon," he was 54 years old but hardly washed up. In recent years, he had made "Easter Parade" and "Royal Wedding," and his future held "Funny Face" and "Silk Stockings." 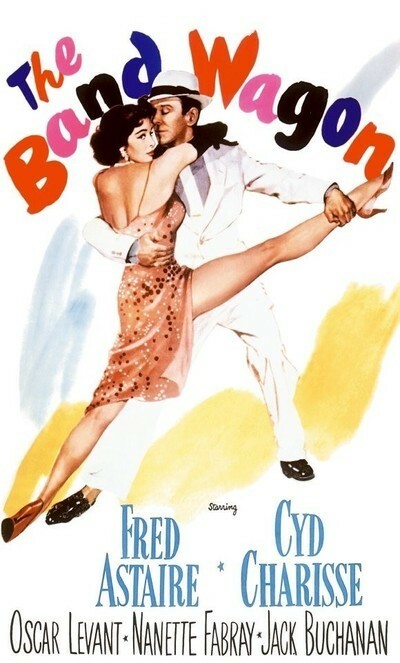 But in the movie as in life, he is insecure about his gifts; "Fred rehearsed until he drove you crazy," remembers co-star Nanette Fabray, and he was uneasy about co-starring with Cyd Charisse. "She's rather tall, isn't she?" he worries in the movie, and Fabray assures him, "It's a stage illusion." It wasn't. Charisse was fully as tall as Astaire, taller with heels, and she had classical dance training; Astaire's Tony Hunter complains about "this little ballerina's snide insinuation that I'm only a hoofer." Real insecurities and rivalries were right beneath the surface of the fictional ones created by Comden and Green, and real personalities are not far offscreen; they even based the writers Lily and Lester Marton on themselves (Minnelli cast them as Oscar Levant, who looked like Green, and Fabray, who had Comden's spirit). The Astaire and Charisse characters are brought together by Jeffrey Cordova (Jack Buchanan), a director-producer-star with artistic pretensions, who thinks the lively little musical by the Martons should be reworked as a version of "Faust." The Cordova character is said to be inspired by Jose Ferrer, who at the time was starring in one Broadway show and producing three others, but in the ego and the big plans there's also an echo of Orson Welles. The overblown Faustian musical is a flop in New Haven; a stagehand observes, "You've got more scenery in this show than there is in Yellowstone National Park." As the depressed actors and dancers gather in a hotel suite, they cheer themselves with the "I Love Louisa" musical number, "but only for the time it takes them to sing and dance," writes the critic Joe McElhaney. "The moment the song is finished everyone goes into a depressed slump." Levant in fact looks like he's depressed most of the time. A real-life hypochondriac whose character recites a list of complaints early in the movie, Levant was a friend and good-luck mascot for Arthur Freed, the key producer during MGM's golden age. That's how he got so many good supporting roles (as in "An American in Paris"), despite often looking grumpy and exhausted. "Oscar needed someone to yell at," Fabray remembers in an interview on the DVD. When he blew a line, he'd blame it on somebody -- usually picking on Fabray, who was appearing in her first movie. After she told him to go to hell, she says, he backed off. All of the interviews with the surviving cast members suggest the film was an unhappy shoot, although they don't quite say why. Minnelli's offstage marriage problems with Garland may have been one reason, Astaire's ambivalence about Charisse might have been another, Levant's daily appearance represented what he liked to call "a pharmaceutical miracle," and Buchanan was undergoing painful dental surgery. Still, a great musical emerged from the shambles, just as it does in the story. Despite the elegance of "Dancing in the Dark" and the long "Girl Hunt" ballet sequence toward the end (with Astaire as a private eye and Charisse a slinky dame in red), my favorite musical number is an early one, "Shine on Your Shoes." Liza Minnelli, then 7, followed her father around during the filming, and remembers him scouting Penn Station for ideas about the soundstage sets. Minnelli saw Leroy Daniels, a real shoeshine man who sang and danced as he worked, and that not only inspired the number, but got Daniels a trip to Hollywood and a scene where he co-stars with Astaire. He's a gifted performer, his timing as precise as Astaire's, and perhaps because he's the real thing, we sense a freshness and joy. Note, too, Astaire's casual strength when he lifts himself on the arms of the chair so he can kick in mid-air. Most of the scene's charm is because of Astaire and Daniels, but some, too, was contributed by Minnelli. McElhaney recommends watching the "Shine on Your Shoes" number, but not focusing on Astaire and Daniels: "Instead, only take note of the direction of the extras; watch it again, and only note the function of the decor and the camera movements; then watch it one final time putting all of these elements together." What that exercise would illustrate is that for Minnelli, the whole screen was always in play, not just the foreground and the stars. Many of the movie’s songs, by Arthur Schwartz and Howard Deitz, already existed; MGM in those days didn’t simply recycle Broadway hits but created new musicals from scratch, often using songs it already owned. That works here because, after dumping the Faustian musical, the performers decide to put on a revue. One song written new for the movie would become a touchstone: Deitz and Schwartz’s “That’s Entertainment,” which celebrates show business in a way as joyous but not as zany as Donald O’Connor’s “Make ‘em Laugh” in “Singin’ in the Rain.” One of their older songs that makes an unconvincing reappearance is “Louisiana Hayride,” originally written in 1932; although in a revue anything, so to speak, goes, the hayride seems like a stretch. Another musical sequence, the bizarre "Triplets," shows Astaire, Fabray and Buchanan all apparently midgets dressed as babies, sliding down from their high chairs and dancing. Since we see their feet hit the floor and special effects seem impossible, how did they do it? By balancing on artificial legs strapped to their knees, Fabray reports; they fell dozens of times before getting it right, and relied on pain-killers. All of these backstage details seem like a distraction from the magic of "The Band Wagon," but part of the film's appeal comes from our sense that what we see is not far removed from the actual process of making the movie. It's entertainment, all right, but it's also hard work, and Astaire chain-smokes all the way through it. "I don't think a dancer should smoke," Charisse tells him early in the film, but by the end, she's bumming a cigarette.